The golden eagle is a large bird of prey, powerful and clever, with a wing span of up to 227 cm and a body mass of 3-3.5 kg in case of male birds and 4.5-5.5 kg in case of female birds. The brow of an adult bird is dark brown, the rest of the crown and the nape are golden brown, while the beak is black and the cere yellow. The upper half of the bird’s body is dark brown with light (worn) feather edges and the entire lower half looks rather dark outdoors. A young bird is dark chocolate brown, has a golden crown, white spots on its wings and a wide white area on its tail stock. 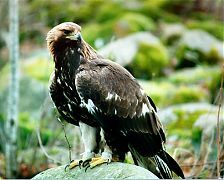 In Estonia, the golden eagle feeds mainly on white hare, black grouse and great grouse. The diet is diversified by mammals like grey hare, roe, squirrel, marten and racoon dog, and birds like raven, hazelhen, mallard and crane. 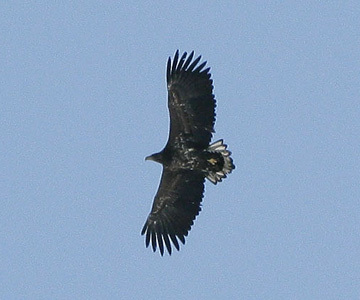 In winter, the golden eagle often feeds on carrion. The golden eagle is sedentary and spends the winter near its nesting place. Young birds who are not yet sexually mature, travel about more. The golden eagle inhabits suitable nesting places for decades – at least a quarter of the current nesting places can be traced back through literary references to information passed on by word of mouth to the 19th century. Golden eagles have usually chosen the pine as their nest tree. Only on rare occasions have nests been built in firs or aspens. At times, one pair of eagles has two nests that are inhabited in turn. A clutch consisting of one or two eggs is laid in the nest during the first half of March. The chicks hatch during the second half of April, and on most occasions, only one of the offspring learns to fly by the beginning of July. 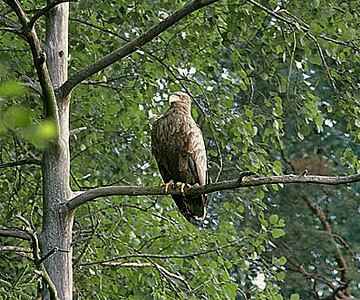 The golden eagle is common throughout Estonia. It inhabits larger natural massifs and prefers to live in bogs. At the beginning of the 20th century, 20-30 pairs of golden eagles nested in Estonia. In the years 1964-1973, the eagles were only observed in up to 12 nesting locations and nesting was successful in just 4-6 nests every years. 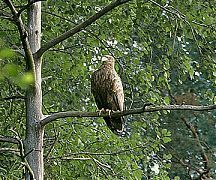 During the last couple of decades the situation has improved and the number of golden eagles nesting in Estonia has remained rather stable at 40-50 pairs. A few nests have also been found in untraditional locations, such as on the edge of peat deposits or on lakeshores. The osprey is the smallest of Estonia’s eagles, but also has the most distinctive appearance. Its light lower body, the dark bends of its wings, the multicoloured head and its gull-like appearance when flying help differentiate the osprey from other eagles even without the help of optical instruments. One still has to be observant when identifying the osprey – at the first glance they look remarkably similar to large gulls. 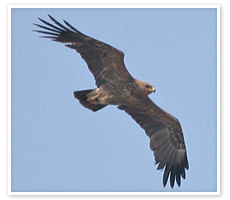 Its wing span is 145-160 cm, its body weight is 2 kg for female birds, and about 1.5 kg for male birds. 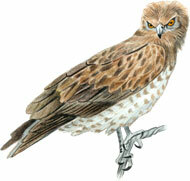 When tracking its prey, the osprey flies in place (hovers in the air) similarly to the common buzzard, the short-toed eagle and the common kestrel. The osprey makes high-pitched squeaking sounds—it is especially vocal when its nest is being disturbed. As its Estonian name (literally “the fish eagle”) suggests, our smallest eagle feeds almost entirely on fish. It is probable that the sleeker body of this species has developed during evolution in order to improve its chances of catching fish and makes the osprey better suited for executing moves requiring dexterity. 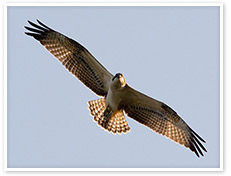 Its more dextrous and faster flight is the osprey’s advantage compared to its larger relatives. However, the osprey can never be sure that the fish it has caught will remain its prey, since in many good hunting grounds, white-tailed eagles have specialised on taking over the ospreys’ catch. Fish are caught from as deep as a meter below the surface, and sometimes, the entire osprey can disappear under water during this process. The osprey’s favoured prey is fish weighing 200-300 grams: it is difficult to fly far with a larger fish and catching smaller ones would be inefficient. The osprey can transport prey to its nest from a distance of over 25 km! Ospreys are everyday visitors at some fish farms and perform the necessary task of removing injured or diseased fish, although healthy fish also fall victim to their attacks. However, when the fish in the ponds grow too large for the birds (over 400 g), the ospreys relocate to other hunting grounds. One osprey needs about 300 g of food per day. If the ospreys reach the final destination of their migration before the ice has melted, or if their nesting period is dominated by especially bad weather, the birds have to either fast or feed on other prey—thus, osprey have also been seen hunting mice and frogs. The ospreys reach their nesting areas in spring, even before the first bodies of water have been freed of ice. They immediately begin repairing their old nests, or building new ones if the previous nests have not survived the winter. Natural nests are often destroyed by storms—the nests are always located at the tops of trees, and therefore, have no protection against the forces of nature. The nests also collapse due to the fact that the osprey cannot find nesting trees that are strong enough to withstand the winds. To alleviate this problem, eagle enthusiasts have built artificial nests in place of destroyed ones or on nearby trees that are suitable for nesting. Nests built in treetops also have their advantages—the birds can recognise potential danger earlier, flying onto the nest is easier and it is easier for the fledglings to learn to fly. The hen stays with the nest after laying the eggs and it is the task of the male bird to bring enough prey to the nest to feed the hen and the chicks. If you happen to find an eagle’s nest located on top of a tree, like that of a white stork, it probably belongs to an osprey. 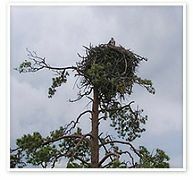 By the way, in America the osprey usually nests in places preferred by the white stork in Estonia. The osprey lays 2-3 eggs and the hatched chicks usually learn to fly by the end of July. After achieving flight, they still have much to learn about catching their prey, however. Thanks to the environment (primarily bodies of water) being freed of pollution by chlorine organic compound (e.g. DDT), and partly due to the construction of artificial nests, the productivity of Estonia’s ospreys (i.e. the average number of chicks hatched by nesting pairs) is one of the highest in the world. The osprey inhabits almost every continent. Here it nests mainly in Eastern and Southern Estonia and is slowly expanding towards the west. 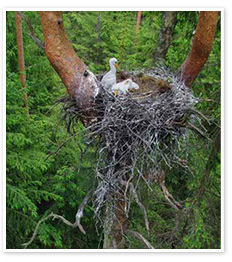 As of 2005, 50-55 pairs of osprey nest in Estonia. As recently as 1985, there were only five known pairs nesting in Estonia, so the number of ospreys has grown 10 times during the last quarter of a century. The wing span of the black stork is 185-205 cm. It resembles the white stork, but is a little smaller than its relative and has a black neck and the underside of its wings is black. An adult bird is white from its chest down to the underside of its tail, the rest of its plumage is black with a strong purple-green metallic shine and its beak and legs are red. In case of a young bird, the black colour of the plumage is replaced with dark brown and the olive green of the legs and beak range with greyish pink. Ancient Estonians believed that this timid and rarely seen inhabitant of the woods pordents death. Probably this bird with a deathly black “cloak” was also the one “generally considered a holy bird” (Helme). 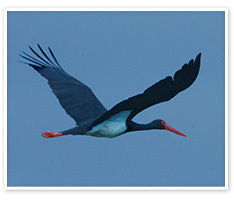 It is likely that the bird called “piva-lind” (the holy bird) in the Livonian language also indicated the black stork. Sadly, no one remembers the ancient Estonian names for the black stork, however, Russian linguists have discovered that, in the old Novgorod region, the word “aist” (stork) had the same meaning as the word “estonets” (an Estonian) does today to the people of that area. The main food of the black stork includes all kinds of fish and amphibians that it prefers to catch from small forest rivers and ditches. On rarer occasions, the black stork can be seen feeding from lakes, fish ponds, shallow seawater, and meadows. Research in recent years indicates that male birds can fly distances of up to 25 km from the nest to reach good feeding grounds. The black stork is a migratory bird. The male birds reach Estonia by the beginning of April, even before the snow and ice have melted and the female birds follow a week or two later. During the period 1987 – 1996, the earliest date of sighting was March 16th, the average arrival time was March 30, and the last autumn sightings occurred during the middle of September. The black stork travels to its wintering area, extending from the Mediterranean countries to the Equator, either alone or in a small group. After returning, the male birds start to repair their nests right away to win the approval of the soon-to-arrive female birds. Since Estonia is situated on the northern border of the black stork habitat, not all male birds find mates here. Black storks attain sexual maturity at three years of age. The oldest known black stork living in the wild reached the age of 18 and its zoo-dwelling counterpart survived till 30. After mating, the female bird lays 2-5 (6) eggs and the parents take turns brooding the eggs for approximately five weeks. After the chicks have hatched, one adult bird always stays with the nest in order to guard its offspring against predators and unfavourable climate conditions. As the young birds grow and their needs increase, both adult birds have to leave in search of food. At the beginning of August, the offspring fly out of the nest, but still return to stay the night for a week or two. The black stork is common from Western Europe to the Far East and the population of the species is estimated at 15,000 pairs. The number of black storks nesting in Estonia has fluctuated greatly since the middle of the 20th century. At the beginning of the 1960s, an estimated 150 pairs nested in Estonia. This was followed by a significant increase in the population—according to the bird atlas, 250 pairs nested in Estonia at the beginning of the 1980s. During the last 20 years, the number has fallen to 100-115 pairs. Serious attention must therefore be paid to the protection of the black stork, and in addition to protected nesting sites, it is necessary to preserve former nesting sites, so that the population can increase. Meanwhile, the black stork has started expanding its habitat towards the west and has begun nesting in several Western European countries like Belgium, France, Luxembourg and Italy. A similar tendency has been noted in Estonia—until 1970, no proof existed of the black stork nesting on our western islands, but now the distribution map shows that Saaremaa has become one of Estonia’s most densely populated counties. The nesting sites of the black stork are located in larger forest masses, far from human habitation. Their preferred forests include marshland forests and mixed forests, but black stork nests can also be found in moorland pine forests.